Harasim, L. (2012). 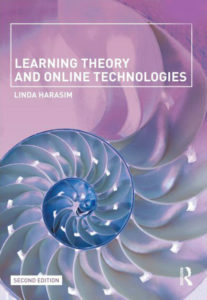 Learning Theory and Online Technologies. RoutledgeFalmer, Taylor & Francis Group, New York. Harasim, L. Hiltz, S.R., Teles, L. and Turoff, M. (2005). Redes de aprendizagem: Um guia para ensino e aprendizagem on-line. Portuguese. Editora Senac: Sao Paulo, Brazil. Harasim, L. Hiltz, S.R., Teles, L. and Turoff, M. (2000). Redes de aprendizaje – Guia para la enseanza y el aprendizaje en red. Spanish. Barcelona: Editorial Gedisa, Spain. Harasim, L., Hiltz, S.R., Teles, L. and Turoff, M. (1995). Learning Networks: A Field Guide to Teaching & Learning Online. Cambridge: MIT Press. Harasim, L. (1990). Online Education: Perspectives on a New Environment. New York: Praeger Publishers. Harasim, L., and Johnson, E.M. (1986). Educational Applications of Computer Networks. Toronto: Ontario Ministry of Education Press.